Other ingredients: sorbitol, microcrystalline cellulose, modified cellulose gum, stearic acid, and colloidal silicon dioxide. Contains wheat/gluten. eating and digestive problems such as anorexia, chronic diarrhea, and vomiting. prevent anemia and menopausal symptoms. 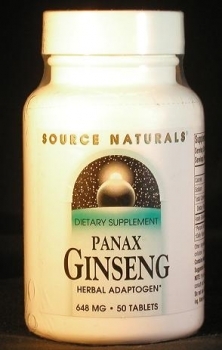 Ginseng, the powdered root of the plant Panax ginseng, has been used for thousands of years to treat specific ailments and to achieve general vitality. In Chinese medicine, for example, ginseng is considered a remedy for irritability, insomnia, and restlessness; for palpitations, cold perspiration, breathing difficulties, and coughing; for very weak pulses; weakness, anorexia, chronic diarrhea, and vomiting. In the West it is used as a general stimulant for mind and body, to slow aging, and to improve memory, libido, and immunity. It has been shown to improve the effectiveness of anti-cancer drugs, and has also seen use as a treatment for hepatitis, anemia, menopausal symptoms, and bacterial infections. Ginseng’s medicinal properties are attributed to the ginsenosides it contains. Ginsenosides are complicated molecules, part steroid and part sugar, that influence the body’s production of steroid hormones. Ginseng contains many different types of ginsenosides — the types and amounts vary widely depending on the species of ginseng, the time of harvest, and the processing procedure. Hence, different brands can have different effects, and it may be necessary to experiment with various brands and dosages until you find one that you like.